This article is about the Australian highway. For the EastEnders character, see Stuart Highway (EastEnders). Stuart Highway is one of Australia's major highways. It runs from Darwin, Northern Territory, in the north, via Tennant Creek and Alice Springs, to Port Augusta, South Australia, in the south – a distance of 2,834 km (1,761 mi). Its northern and southern extremities are segments of Australia's Highway 1. The principal north-south route through the central interior of mainland Australia, the highway is often referred to simply as "The Track". The highway is named after Scottish explorer John McDouall Stuart, who was the first European to cross Australia from south to north. The highway approximates the route Stuart took. 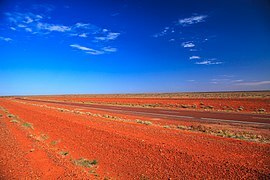 Stuart Highway runs from Darwin, Northern Territory, in the north, via Tennant Creek and Alice Springs, to Port Augusta, South Australia, in the south – a distance of 2,834 km (1,761 mi). The Royal Flying Doctor Service uses the highway as an emergency landing strip and sections of the highway are signed to that effect. These sections of highway have been specially selected and prepared for the landing of aircraft which only takes place after the piece of road has been closed by the police. There are petrol and other facilities (meals, toilets, etc.) available at reasonable intervals (usually around 200 km (120 mi)) and more frequent rest stops. Some of the rest stops are located at scenic points with information boards, but others are little more than a picnic table and a rubbish bin in an otherwise deserted area. The Northern Territory section of the Stuart Highway starts from the edge of the Darwin Central Business District at Daly Street and continues as a dual-carriageway to the Arnhem Highway in Howard Springs. The highway continues 317 km (197 mi) south passing the Kakadu Highway to the Victoria Highway at Katherine. At Daly Waters, the route number changes from National Highway 1 to National Highway 87. The highway then continues 673 km (418 mi) south passing the Roper Highway, the Carpentaria Highway and the Buchanan Highway to the Barkly Highway at Tennant Creek. The highway continues 508 km (316 mi) south into Alice Springs passing the Plenty Highway. It passes through the Macdonnell Ranges and finally crosses the South Australia/Northern Territory border south of Kulgera. The highway was only fully sealed in February 1987 as part of the Australian Bicentenary roadworks programme. There are no police patrolling the majority of this remote highway and until the end of 2006 there was no speed limit outside towns and other built-up areas on the Northern Territory part. The bulk of the Northern Territory's population not living in Darwin lies along its track. At the Northern Territory/South Australia border the route number changes from 87 to National Highway A87. The Stuart Highway passes through the Far North region to Port Augusta. The highway passes through the Woomera Prohibited Area where travellers may not leave the road. The highway continues south-east towards Adelaide. John McDouall Stuart led the first successful expedition to traverse the Australian mainland from south to north and return, through the centre of the continent, in 1861–1862. In 1871-72 the Australian Overland Telegraph Line was constructed along Stuart's route. 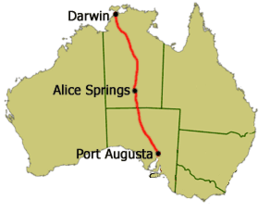 The principal road from Port Augusta to Darwin was also established on a similar route. A track developed along the route of the telegraph, and by 1888 the road between Adelaide and Alice Springs was well known. Several wells along the route provided water, although these could run dry or be contaminated by dead animals, resulting in sections as long as 144 miles (232 km) without water. The route was traversed by motor vehicles in the 1920s. While passable, sections of the road could be sandy, boggy, washed away in the winter, or rugged with boulders. Several creek crossings were required, though few were difficult. North of Alice Springs the road was in comparatively good condition, with sections allowing speeds of up to 50 miles per hour (80 km/h). With the onset of World War II, supply roads leading to the north of the country were considered vital by the federal government. A central north–south highway was planned to connect the railheads at Alice Springs and Birdum, with surveying completed in August 1940. The task of constructing the highway was split between the Main Roads Departments of three states, to ensure completion before the next wet season. New South Wales would construct the northern section of 91 miles (146 km), Queensland the central section of 90 miles (145 km), and South Australia the southern section of 131 miles (211 km). The Alice Springs–Birdum road was completed by December 1940, – upgraded from an often impassable track to an all-weather sealed highway that could cope with heavy military traffic. The 306-mile (492 km) highway was built in under than 90 days. In one week, 11 miles (18 km) was constructed, which was claimed to be a world record. The new highway, in conjunction with the railways at either end, reduced the impact of Darwin's isolation. Quick and efficient movement of military equipment and troop was possible, with the road remaining open throughout the wet season. By March 1941, military authorities advocated extending the Alice Springs–Birdum road to Darwin. During the wet season, the road north of Birdum was impassable, which meant that a single railway line was the only connection through to Darwin. Construction was underway by October 1941, once again at a fast pace in an attempt to finish before the next wet season. The road was nearing completion in July 1942, although some sections were yet to be bitumenised. There was no absolute speed limit in the Northern Territory before 1 January 2007 but maximum speed limits are now posted on some road sections. Drivers, previously, were simply required to drive at a safe speed to suit the conditions. Thus, the Northern Territory section of the Stuart Highway had no speed limits at all. The Northern Territory traffic laws were updated from 1 January 2007 to be similar to the rest of Australia. This included placing a speed limit on all roads (130 km/h or 81 mph on major highways such as the Stuart Highway) and significantly increasing penalties for speeding. The South Australian Section is signposted as 110 km/h (68 mph) outside built-up regions, between Port Augusta and the Northern Territory border. In October 2013 the NT Government announced a trial period of reverting to an open speed limit on the 200 km (120 mi) stretch between Alice Springs and Barrow Creek, beginning 1 February 2014. In September 2015, following the conclusion of the trial, a 276 km (171 mi) stretch of the highway had its speed limits permanently derestricted. As of November 2016, a speed limit has been reinstated, with the maximum speed now being 130 km/h (81 mph). Motor races have been proposed or undertaken on the highway since the 1950s. In 1994 the first and only Cannonball Run in Australia ran from Darwin to Yulara and back again. Based on similar events in the United States, this event ended in tragedy when an out of control Ferrari F40 crashed into a checkpoint south of Alice Springs, resulting in the death of the two event officials manning the checkpoint as well as the two competitors. The remainder of the race had a 180 km/h (112 mph) speed limit imposed to prevent further accidents. Stuart Highway is the highway taken in the World Solar Challenge. The 3,000 kilometres (1,900 mi) race starts in Darwin, follows Stuart Highway to Port Augusta, and then Highway 1 through to Adelaide. ^ "Stuart Highway" (Press release). Australian Towns, Cities and Highways. Archived from the original on 29 August 2008. Retrieved 11 April 2008. ^ Chris Burns (19 November 2004). "Minister Opposes Speedometer Limits" (Press release). Government of the Northern Territory. Archived from the original on 21 July 2005. Retrieved 11 June 2006. ^ Brownrigg, Blake (25 August 1950). "Up North: Highway of the Past and Future". Barrier Miner. New South Wales, Australia. p. 4. Retrieved 29 March 2017 – via Trove (National Library of Australia). ^ "Minerals in the Macdonnell Ranges". The Express And Telegraph (Second ed.). South Australia. 5 October 1888. p. 4. Retrieved 29 March 2017 – via Trove (National Library of Australia). ^ "Correspondence". Northern Territory Times And Gazette. Northern Territory, Australia. 7 April 1899. p. 3. Retrieved 29 March 2017 – via Trove (National Library of Australia). ^ "Overland Motor Race". Observer. South Australia. 23 August 1924. p. 26. Retrieved 29 March 2017 – via Trove (National Library of Australia). ^ "Notes and Notices". The Australasian. Victoria, Australia. 6 June 1925. p. 46. Retrieved 29 March 2017 – via National Library of Australia. The road from Katherine to Darwin was very bad, and their motor-car was bogged many times. ^ Madigan, C. T. (17 December 1927). "Notes on Central Australia: A Drought-stricken Region". Observer. South Australia. p. 21. Retrieved 7 April 2017 – via Trove (National Library of Australia). ^ a b "A History of Australian Road and Rail" (PDF). Department of Infrastructure and Transport, Australian Government. Archived from the original (PDF) on 17 March 2012. Retrieved 18 March 2017. ^ a b "History Of Roads In Australia". 1301.0 - Year Book Australia, 1974. Australian Bureau of Statistics. 25 January 1974. Retrieved 18 March 2017. ^ "Rush Job On Highway". The News. South Australia. 24 August 1940. p. 4. Retrieved 7 April 2017 – via Trove (National Library of Australia). ^ a b "Engineers Show The World". The Sydney Morning Herald. 15 February 1941. p. 9. Retrieved 10 April 2017 – via Trove (National Library of Australia). ^ "New All Weather Highway". Northern Standard. Northern Territory, Australia. 20 August 1940. p. 5. Retrieved 7 April 2017 – via Trove (National Library of Australia). ^ "Queensland Section of Inland Road Well Up to Schedule". The Telegraph (City Final ed.). Queensland, Australia. 1 November 1940. p. 3. Retrieved 10 April 2017 – via Trove (National Library of Australia). ^ "Answer to Correspondent". Northern Standard. Northern Territory, Australia. 3 January 1941. p. 10. Retrieved 10 April 2017 – via Trove (National Library of Australia). ^ "Australia's "Great North Road": New Highway Has Romance and Strategic Importance". The Australasian. Victoria, Australia. 10 May 1941. p. 12. Retrieved 2 June 2017 – via Trove (National Library of Australia). ^ "Link All States". Newcastle Morning Herald And Miners' Advocate. New South Wales, Australia. 12 March 1941. p. 5. Retrieved 2 June 2017 – via Trove (National Library of Australia). ^ "New Roads are Spanning a Continent". Week-end Magazine. The Argus. Victoria, Australia. 11 October 1941. p. 1. Retrieved 1 September 2017 – via Trove (National Library of Australia). ^ "North–South Road". The West Australian. Western Australia. 23 July 1942. p. 3. Retrieved 1 September 2017 – via Trove (National Library of Australia). ^ "The Mne and the Road". The Argus. Victoria, Australia. 25 July 1942. p. 1. Retrieved 1 September 2017 – via Trove (National Library of Australia). ^ "Alice Springs, Darwin Road". The Central Queensland Herald. Queensland, Australia. 3 September 1942. p. 17. Retrieved 1 September 2017 – via Trove (National Library of Australia). ^ "Section 3 The Driving Rules". Road Users' Handbook (PDF). p. 59. ISBN 0-7245-4869-6. Archived from the original (PDF) on 19 May 2006. Retrieved 11 June 2006. ^ "Speed limits to be introduced on NT open roads". 7:30 Report. ABC. 2 November 2006. Retrieved 5 January 2007. ^ "Motorists caught breaking new speed limit". ABC. 2 January 2007. Retrieved 5 January 2007. ^ "Open speed limit on trial and under fire". The Australian. 16 October 2013. Retrieved 13 December 2013. ^ "Peak medical bodies unite to condemn Northern Territory trial of unlimited road speeds". ABC. 17 January 2014. Retrieved 27 January 2014. ^ Charlwood, Sam (3 September 2015). "NT speed limits permanently derestricted". Drive. Sydney: Fairfax Media. Retrieved 18 January 2016. ^ Hinchliffe, Mark (3 November 2016). "NT restricts speed despite evidence". Australia: Motorbike Rider. Retrieved 4 December 2016. ^ "Stuart Highway Race Challenge". Townsville Daily Bulletin. Queensland, Australia. 12 August 1950. p. 3. Retrieved 2 June 2017 – via Trove (National Library of Australia). ^ "2,000-Mile Race?". Brisbane Telegraph. Queensland, Australia. 22 November 1950. p. 8. Retrieved 2 June 2017 – via Trove (National Library of Australia). ^ "Fined For Record Attempt". The Examiner (Tasmania). Tasmania, Australia. 4 August 1951. p. 8. Retrieved 2 June 2017 – via National Library of Australia. ^ Cass, Rebecca (2001). "Cop swaps crooks for corks (page 17)" (PDF). The Drum, 2001: Farewells. Northern Territory Police, Fire and Emergency Services. Archived from the original (pdf) on 7 September 2006. Retrieved 12 June 2006. ^ "Route Map". World Solar Challenge. Archived from the original on 2 June 2017. Retrieved 2 June 2017. Lee, Nicole (1 August 2008). "Memories of the Stuart Highway". ABC Alice Springs. Australian Broadcasting Corporation. Archived from the original on 6 March 2016. Retrieved 5 June 2017. Additional archives: 27 June 2012. "The Track: 1000 Miles to War". Northern Territory Library. Northern Territory Government. Archived from the original on 18 February 2017. Retrieved 5 June 2017.